I'm also entering my card in TSG's Sewing and Stitching Challenge! Colourful & fabulous Shannon! I like how you have coloured that turtle... the bits of yellow in the tummy area look so good and your shading is great! Nice layout too. Fun, fun card, Shannon! Love the color combo with that hot p[ink and the orange. Love the ribbon! Wow, this is gorgeous! You have created an extremely sweet and gay card. This card spreads a fantastically good mood at once. The small and cute tommy is coloured perfectly and it seems as if he whispers a hello to everyone. And also the background is very beautiful. Oh, this is just darling, Shannon! Such happy and bright colors! Precious. How bright and fun! He's such a little cutie! How fun! Love the turtle. So very cute!! You should enter the challenge at TSG this week too - the challenge there is stitching - real of faux. This card is just perfect. Adorable card Shannon! That turtle looks adorable and I love the vibrant balloons! Shannon this is seriously adorable! I love the turtle and your coloring is fabulous! Hey, I just saw this guy holding a flower, and now with the balloons -- he's such a thoughtful feller, not to mention utterly cute and adorable. My kind of guy! 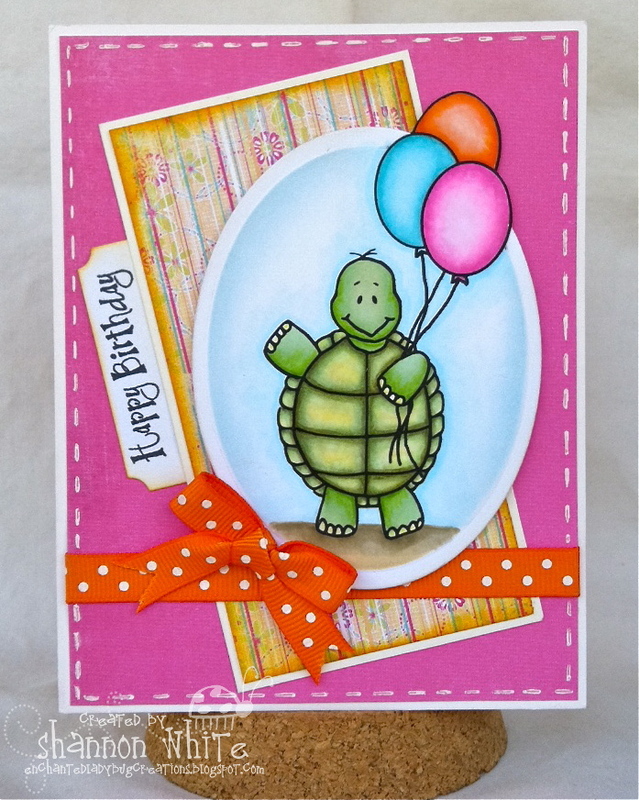 Cute card and great birthday colors, Shannon!